I have been doing a lot of reading lately after a period last year when I did not touch a book. Mostly these books are related to science and published in the last year and I am devouring them at a rate of one per week or two. A recent one was very compelling and was eagerly read over breakfast, lunch and in the gym over a few days this week. 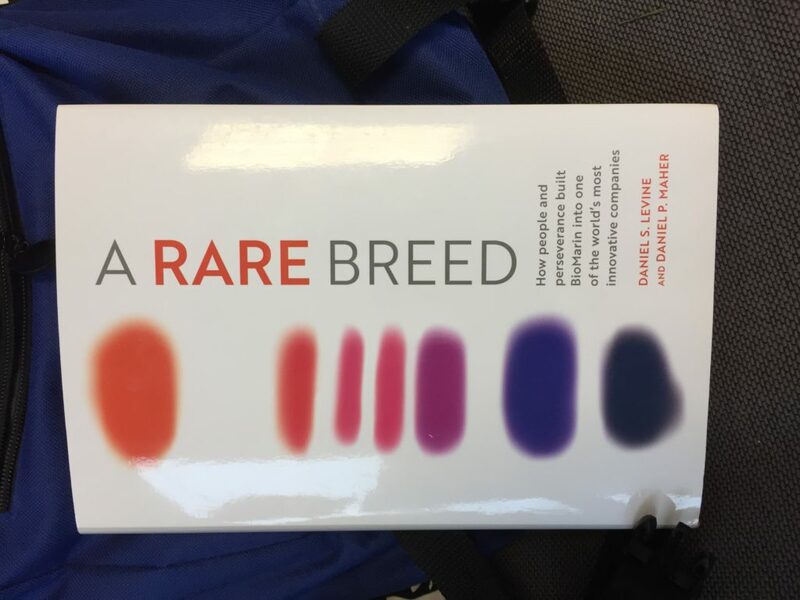 The book is “A Rare Breed” by Daniel S. Levine and Daniel P. Maher. This book is different in that its published by Biomarin. Yes that’s right, a drug company published a book and apparently there is a tie in movie too. The book chronicles the 20 year story of what is primarily a rare disease drug company. Surprisingly it does go into some uncomfortable territory. It reveals that some CEOs and others at the company may not have been perfect. No surprise, especially for those driven by getting drugs approved. But more importantly the book demonstrated the Biomarin perseverence, overcoming the ups and downs, the bad and the good deals. The book also shares a few patient stories. As someone that has worked in rare diseases for a relatively short time I found the book spoke directly to me. It gave me useful advice and it definitely provided a shot of reality in how much effort and how big of a team you need to get a treatment approved (in many cases here they are biologics). There were parts were I felt like a fly on the wall, at least I think some of the meetings described would have been fascinating to attend. Skipping through 20 years and a lot of success and failure in 220 pages is some accomplishment. There were periods of repetition of a few rare diseases but not too much. What was missing for me was literature, references to go along with some of the background. Yes it felt like a booster for the company at times but rightly so they have done so much for so many with relatively little money in comparison to the truly big companies in the same space. The book has to be required reading for any parent / patient advocate, scientist, VC, regulator. I found myself texting snippets to rare disease parents and scientists to get their take. I think this sets the standard for a book on rare disease R&D and for me it may become something of a touchstone. I want people to read this book because they will learn what it took to get the treatments approved. They will learn that it takes exceptional people to drive this. By the end of the book it is apparent that the company has always been fighting with what it wants to be. Fighting to remain independent. Fighting for the rare disease patient… Now I need to watch their movie. Its been a while since my last post here but its getting harder to find time between the 2 companies and writing grants. 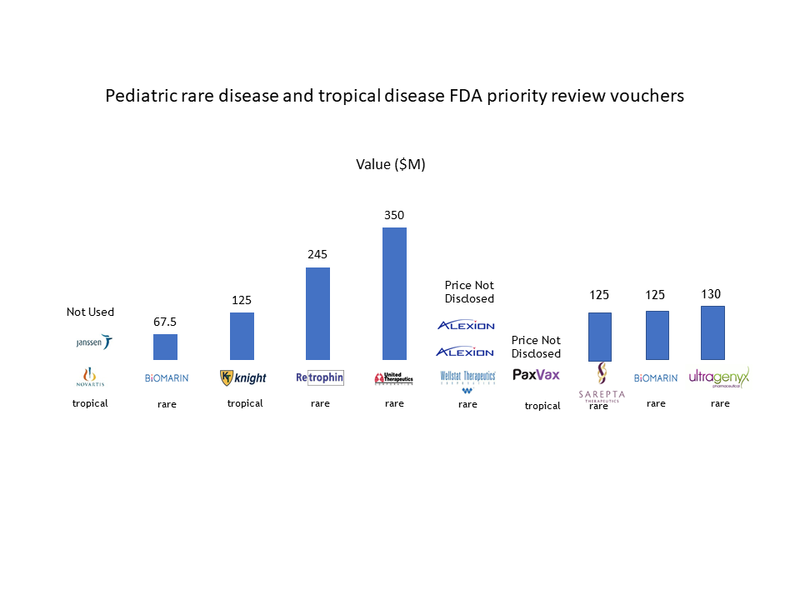 But one of the most interesting things I have been watching has been the roller coaster ride of the Pediatric Rare Disease priority review vouchers over a few years. The most recent one awarded to Ultragenyx will doubtless also be sold but can you predict how much for? and will it be as much as their last voucher? If I have missed any please let me know. Its been an incredibly fast paced year and hence my posting frequency has suffered. Perhaps its time to get back to writing . Today we had a press release with SRI so that triggered me to fill in the back story. Rewind back to 2014 and the Ebola outbreak was in full flow – see this post from just over 3 years ago. Well that lead ultimately to another paper a year later in 2015 describing machine learning models used to identify in vitro active compounds against the virus. This preliminary work then enabled us to obtain an R21 in 2016. Now we describe the testing in vivo of one of three candidate compounds, namely tilorone. This particular part of the study was led by Peter Madrid at SRI. He took a gamble back in 2015 on buying the 3 compounds I proposed with a Bayesian model based on his data from 2013. Robert Davey at Texas Biomedical Research Institute did the initial in vitro testing which got the ball rolling as well. There is still a fair way to go, perhaps we look in Guinea Pig or non human primate next, but these are expensive studies. However, tilorone is a compound that is widely used in Russia as an antiviral and actually available over the counter. The drugs being evaluated so far for Ebola are novel molecules that have had to undergo extensive preclinical testing for toxicity etc. Sure it would be great if come the next outbreak of Ebola we could have a molecule that could be used to prevent infection as well as treat those infected. The current work is a step closer. We have two back up compounds if this fails and have started to collect a whole array of additional compounds as well with promising in vitro activity that have never been reported. As a small company focused on rare and neglected diseases this project ticks all the boxes. The molecule was discovered with machine learning, the work involves close collaborations with different groups and the molecule is repurposed. While it may not be a hugely profitable area I think we may have proven more than one point. We have shown how the different patchwork of funding in the US can enable screens, which can lead to models and then optimization to get to an in vivo active compound We have taken advantage of different NIH funding and testing resources and so are very grateful for this support. While Ebola is no longer a hot topic we have also shown that realistically it may take a good amount of time to find novel compounds for antiviral outbreaks. And this is a virus we have known about since the 1970’s and there is still no approved efficacious treatment! Here is hoping we have taken a step further to addressing this. So bottom line – watch this space we may have more to come. Our pipeline of projects includes molecules for TB, Chagas and HIV and that is just the NIH funded projects. The frequency seems to be increasing where I see something that sets me off (head in hands saying why, why why? )..Over the past few years I have seen AI/ Deep Learning and drug discovery appearing often and that may not be a good thing. Now this could be the PR engines of the VC’s, companies involved or pharma…or Nvidia needing something new to talk about (or all of these).. Today it was the Wall Street Journal hyping AI up, last year it was the Economist. Now I am as bullish as the next person on the power of these technologies to help with drug discovery but – they really have not been thoroughly tested. Last year I published a small review in Pharmaceutical Research which clearly highlighted that All of the papers using Deep Learning for drug discovery etc. had not prospectively tested the approach and the level of comparison with other methods or even assessment of different descriptors was not performed. My bottom line conclusion was that much more needed to be done to show that Deep Learning really was worth the effort for pharma before we spend time and money. So we are digging into it here as well. We invested in a small server and we have a team doing the experiments that others seem to have forgotten are needed before we can say if its worth throwing more at it. We have to look at technology like this objectively. Is one algorithm really better than all the other algorithms we have? Could it be a competitive advantage for pharma vs what not doing Deep learning? AI / Deep learning is really not new but it is getting attention. Some of it is needed but I urge caution. We have been here before in pharma having jumped on every new technology that has come along as the savior, and after a few years it was clearly not to be. AI / Deep Learning is that new thing..
Today’s article had a quote by John Baldoni (GSK SVP of platform technology and science) saying “the aim is to use AI to cut development time down to a single year from more than 10 in some cases”. I think while this would be great in theory it puts an enormous pressure on the techniques to deliver. Frankly such a quote is not helpful and just sows more doubt and add fuel to the over-hyped machine. Big Pharma is not learning from the lessons of the past. If you have ever wondered how the pill you are taking for your disease originated, then nowadays you don’t have to go far to find out, as a quick search of Wikipedia will return the molecule, who makes it, and a wide array of prescribing information and warnings. This has not always been the case, for many of the FDA approved drugs the histories have been buried in the scientific literature, passed on as oral histories or folklore even in the relatively recent field of pharmacology. You are also likely the beneficiary of some of the best molecule discoveries of the 20th century. These treatments were commonly developed by a wide array of scientists around the world working in the golden age for drug discovery. The probability is high that if you are an older reader you are taking many drugs simultaneously, and this may come with a panoply of side effects and foods to avoid. Besides understanding these interactions, we are also still learning of potential use of the same drugs against different diseases to what they were approved for. Today’s drug for one disease may be tomorrow’s cure for something else. A quick glimpse back to viagra, reminds us that it was intended for a totally different indication originally. Those in search of medicines are the true heroes and rightly hailed in “The Drug Hunters“, which regales us with the many rich tales surrounding the drugs we take for granted, as deftly relayed by Donald Kirsch and Ogi Ogas. The authors should be commended for providing a whirlwind tour of the histories of some of the greatest hits in the cannon of drug discovery (and also the greatest misses) but leaves one wondering if this book signifies the epitaph. Their insights are deftly woven together from the author’s own hunting for antibiotics in soil, heavy emphasis on several well known treatments derived from plants, and the Â deconstruction of natural products that lead to the eventual birth control pill. The latter is an epic caper on which complete volumes have been written but here from an angle that’s surprisingly topical. The rich outsider funding scientific research by the poor researcher makes for an entertaining counterpoint, leaving you to root for this unlikely team that ultimately lead to the contraceptive reaching clinical trials and reshaping society. Some of the stories of discovery corrected the many ‘single inventor’ misconceptions that still linger and rightfully insert the co-discoverers that were omitted. Some errors rankle, like who is the biggest producer of insulin, which I believe is in fact Novo Nordisk. This in itself would make a useful addition to the otherwise excellent chapter on insulin, how a Danish company now leads the way for diabetic treatment. What is missed is perhaps telling at least to someone in the field. X-ray crystallography is all but ignored as is computational drug design and these combined efforts have lead to great life changing blockbusters like Gleevec and other kinase inhibitors for cancer. A number of key rules of thumb to help with drug discovery and productivity have originated over the last twenty years including ‘Lipinski’s rule of 5’ which has helped our understanding of the molecular properties to influence how drugs are absorbed. Recent drug disasters are given short shrift, for example the French drug BIA 10-2474 killed a clinical trial participant in 2016 and injured several others and is not even named, but this links directly to the story of drugs for pain and endorphins. Cannabinoids get no mention and yet the press is overloaded with the stories of cannabis used to treat various rare diseases. In fact, perhaps the most distressing omission is the way that rare diseases are omitted all together and the focus is on drug discovery for bigger diseases. We are in a new age, rare is big and common diseases are probably less profitable. There are pricing pressures and healthcare costs have rocketed, yet the train wreck ongoing in the US is not discussed. Also the massive fines incurred by pharma misdeeds are avoided and these have to impact drug discovery and shape the evolution of the industry. The drug discovery process has perhaps also been flipped on its head. We now have an array of different treatment modalities, from gene therapies, enzyme replacements, antisense oligonucleotides, CRISPR and beyond. Small molecules are no longer the main attraction that they once were. Also, the ones pushing for treatments for rare diseases are likely the parents, they are now the modern day drug hunters hoping for a cure. Indeed, scientists trained as lone drug hunters are almost extinct, they are being substituted and the tools for drug discovery changed. We are in a new collaborative era, where big pharma companies focus on hunting and buying small companies for their molecules at skyrocketing prices and purchase vouchers that get them a faster review at the FDA. So, what is perhaps needed is some impetus to excite the next generation rather than dwell on the past. The drug hunters offers a glimpse of how it was possible to discover a drug, with much more information buried in detailed notes. It also represents a cautionary tale of what can go wrong. Repeating the maxim that developing a drug is a $1.5bn dollar exercise will inspire few new to drug discovery. Unless you are curious, lucky, foolish or stupendously wealthy then the development of new drugs may well be left to the likes of the Bill and Melinda Gates and Chan Zuckerberg foundations that made their money with software and now want to impact healthcare. Ironically, we cannot program drug hunting…yet, but we are increasingly seeing the same machine learning algorithms used widely by the technology companies knocking at the door of the pharmaceutical industry. A case of one industry trying to shape another in its own image. The Drug Hunters of tomorrow will not be remembered in books like this as they will be anonymous autonomous machines, as we perfect the Byzantine process of drug discovery to address the over 7000 rare diseases, let alone the more common ones like Alzheimer’s disease and cancer which still defy human efforts to treat, them with or without moonshots. We are seeking a Biochemist or Chemist (Masters/PhD) for a summer intern assignment in our Raleigh NC offices. The duties of the scientist will be to assist with expert data curation for computational modelling of rare and neglected diseases. This position is ideal for a Masters or PhD student in the RTP or Triad area who desires a short 2-3 month internship or co-op experience. At this time, we cannot sponsor any work permits. Collaborations Pharmaceuticals Inc is a start-up biotech working with foundations, academic scientists and other companies to develop clinical candidates for rare and neglected diseases. Please email resume and cover letter to collaborationspharma@gmail.com. Today a special issue of Drug Today Today was published. 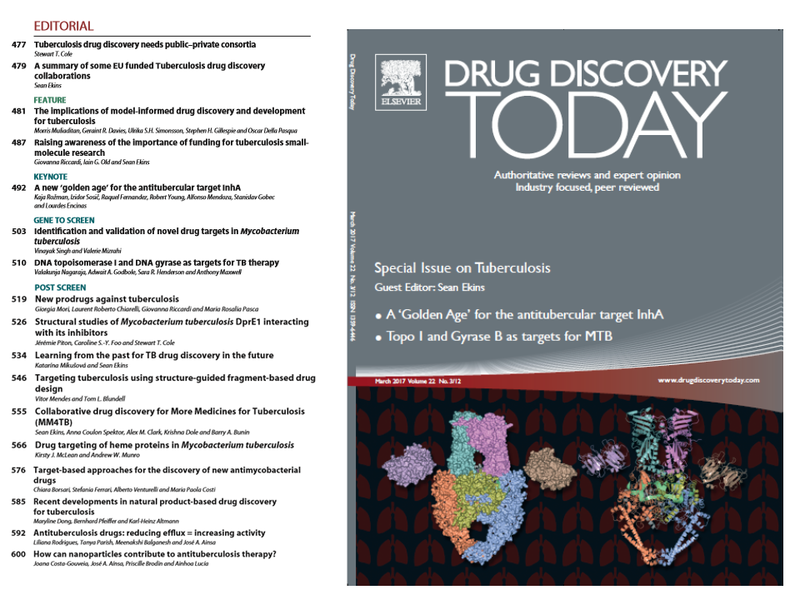 I was the editor of this issue and honored that so many colleagues from our European funded MM4TB and other European projects agreed to provide articles on their contributions to Tuberculosis drug discovery. My initial goal for this special issue was to raise awareness of the cost effective nature of such consortia and how through collaboration we could make progress in small molecule drug discovery. The amount of work performed by the many labs is really just highlighted, and my hope is we could show how continued research on small molecules for TB is essential (take not funding bodies). If anyone would like a copy of this special article please get in touch and I will try to mail one when I get them from the publisher! Its been a few months since the last post. In that time Collaborations Pharmaceuticals has been working flat out. We hired a Postdoc and associate and have been keeping our heads down working on the 3 NIH grants with collaborators. Next week I will be representing the team at the Gordon Conference on Tropical infectious diseases and presenting our first poster which describes Assay Central and its application to quite a few of these diseases. More on that in future posts I hope. Next week we also move into our new lab at the NC State incubator . After being out of the lab since late 1999 its time to head back to one! We are also working on a few grant submissions with new collaborators. Our pitch deck has also gone through numerous updates in the last few weeks. I definitely prefer the science to the business side but I am fortunate to have a few mentors who keep me focused. Last week I also gave a presentation at UNC as part of rare disease week. Prior to that I attended the NIH rare disease day. This was huge compared to previous years and I get the impression there is increased interested even compared to a few years ago. I hope one day to get invited to speak to that audience so we can spread the word about what can be done with relatively limited resources. If this was not enough I also have a new book to edit…so I better get back to work. More in a few weeks.. The successful candidate will participate in the development of the chaperone treatment for the inherited metabolic neurological disorders. He (she) will also participate in pathological and behavioral characterization of gene-targeted mouse models of human diseases. Applicant should have a strong background and research experience in molecular genetics, biochemistry and cell biology (cell culturing, immunohistochemistry). Experience in handling laboratory animals is an advantage. Our chapter is on small molecule databases and deals with the explosion in these over the past decade. We are at the point were there is a massive amount of data that can be used for machine learning to predict bioactivity. This has potential utility but the underlying quality of the data may be an issue that should not be forgotten either. There is definitely a tension between publishing a paper / review and a book chapter. For one its an honor to be invited by the editors, to have your contributions recognized. On the other hand, the accessibility of these books is a challenge unless you have access to a library or significant budget. As both a book editor and contributor there is definitely a conflict here. Sure publishers have to make money to keep the enterprise going, but books and chapters rapidly age and then what? Its unlikely that the editors or contributors ever recoup their time investment in publishing these narrowly focused books. The model is ripe for disruption. Sure, instead of publishing in closed books we could just drop the file in some open publishing repository. There is no money to be made unless you self publish. As long as the contributors get credit, citations etc perhaps thats all that matters to some. Personally I like the physical feel of a real book, to see it on the shelf and to know that some small contribution will last for a while in a library or on some scientists shelf. A bit of permanence in this world were everything moves so fast.